The ANT+ Product Directory is a complete inventory of all ANT+ certified or verified* products. It is a tool designed specifically to help you create your very own monitoring system. Choose from hundreds of cutting-edge products manufactured by top industry brands. Select by specific device, activity, or product category. Within seconds, you’ll discover the best sport, fitness and/or health solutions for you. Please direct all technical questions pertaining to an ANT+ enabled product to the manufacturer. 1. Enter the product model or brand in the search field or select a specific product brand in the “Brands” window located on the left side of the page. 2. Your results will automatically display on the right hand side of the screen. Choose your desired product. 3. When you select your product, a preview of the product will appear identifying the number of compatible products and the available data that the chosen product will share. You will also notice the activity icon(s) listed in this window under Device Capabilities – i.e. the type of data that this product will share. When you find another product with the same activity icon, you have the assurance that they will work together to share this specified data. Click the “More Info” button for full product details. 4. When on the product detail page, you will see a complete listing of all compatible ANT+ products. For further information on the selected product and for purchasing information click the “Visit the Manufacturer’s Website” button. 1. 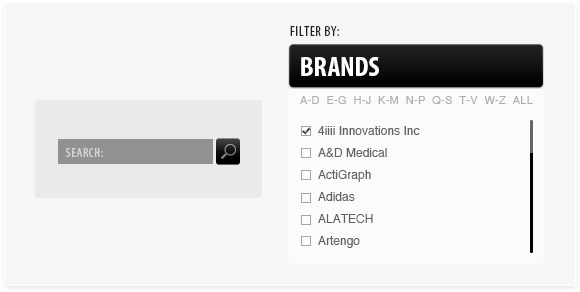 On the Product Directory home page, filter your results by selecting specific Brands, Categories and/or Activities that suit your preferences. 2. Note: Under Categories you have the choice to search either via devices or apps. 3. Under Activities you have the choice to search for products that perform one function only (eg. Cycling OR running). You also have the choice to search for products that perform more than one function – eg. Cycling AND running. 4. Your results will automatically filter down in the main window as you narrow your search. Click on a desired product to access more information. 5. 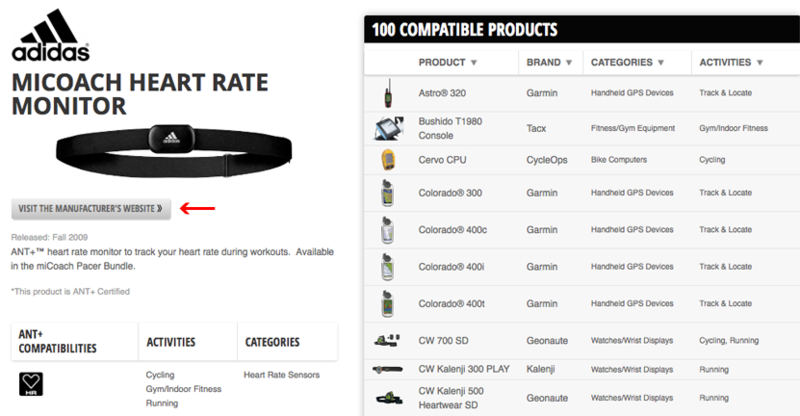 When you select your product, an overview of that product will appear. You will also notice the activity icon(s) listed in this window under Device Capabilities – i.e. the type of data that this product will share. When you find another product with the same activity icon, you have the assurance that they will work together to share this specified data. 5. When on the product detail page, you will see a complete list of other compatible ANT+ products. By compatible we mean that ur selected product is able to interact and function with any of the listed compatible products. 1. Find your product options on the Product Directory by entering the brand into the search field or by selecting the brand from the Category section on the left side of the page. 2. Find and select your product from the list of options provided for you. Click the “More Info” button. 3. When on the product preview page, you will see a complete list of other compatible ANT+ products. By compatible we mean that your selected product is able to interact and function with any of the listed compatible products. You can access more information by clicking onany of the compatible devices. You will also notice the “ANT+ Compatibility” section on this preview screen. 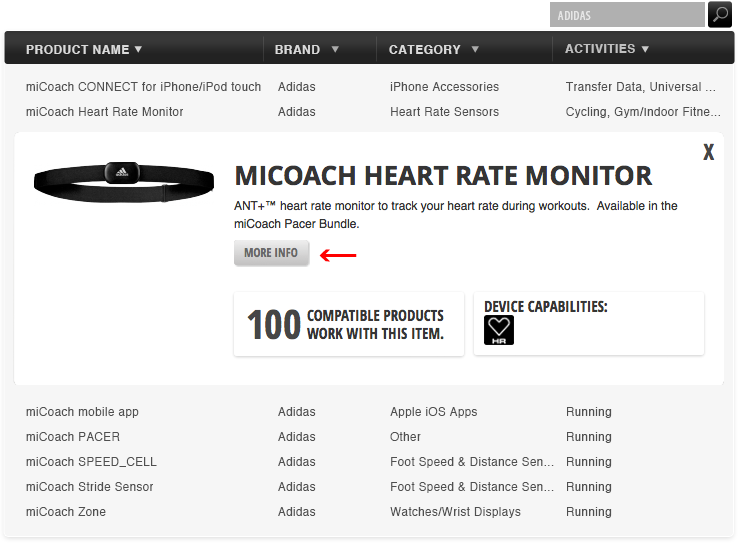 The activity icon(s) listed in this window also repre sent the device’s data capabilities – i.e. the type of data that this product will share. When you find another product with the same activity icon, you have the assurance that they will work together to share this specified data. 1. Enter the device model brand in the search field or select the specific device brand in the “Brands” window located on the left side of the page. 2. Your results will automatically filter down. Choose your desired device. 3. When you select your device, an overview of the product will appear. Click the “More Info” button for full product details. 4. When on the product information page, you will see a complete list of other devices this particular product is compatible with. This page also shows you the typical activities the device is used for and the category it falls into. For further information on the selected product and for purchasing information click the “Visit the Manufacturer’s Website” button. *Please note: Products that have been tested by ANT+ engineers are listed as ANT+ Certified. 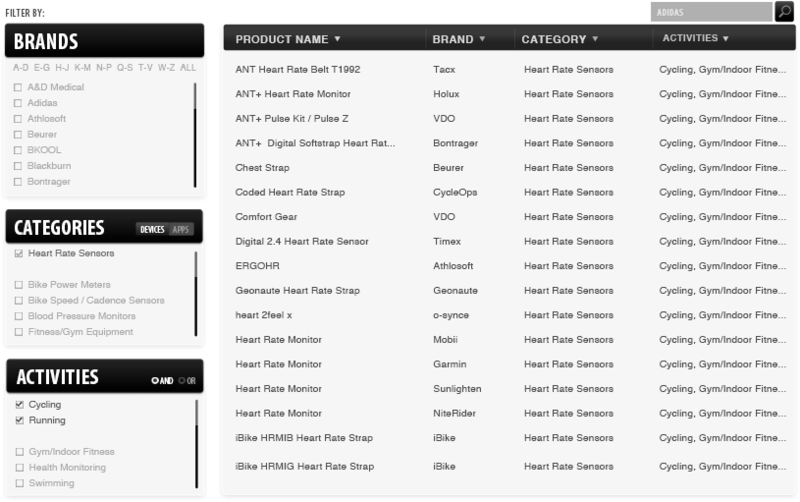 Products that have completed testing with ANT+ self verification test tools are listed as Self Verified. As products complete the ANT+ Certification program they will receive certified status.